The annual global ranking for the world’s largest defence companies for 2014 has been published by the Stockholm International Peace Research Institute (SIPRI). Russian companies grew in 2014, rising several notches on the list. The number of Russian armaments companies in the Top 100 has gone up from nine to 11. 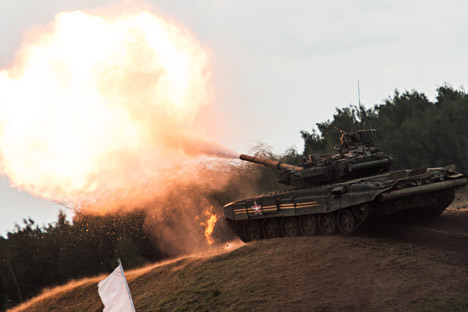 The highest ranked Russian armaments manufacturer, the rank of the holding company rose by one position in 2014, to number 11, with the company’s total sales amounting to over nine billion dollars. Almaz-Antey produces the S-300 and S-400 ‘Triumf’ close-range and long-range anti-aircraft and air defence missile systems. The S-400 covers the sky over Syria. China was the first foreign customer of this air defence system in 2015, and India is now negotiating a purchase of five such systems. The UAC moved from 15th to 14th place over the course of 2014. The UAC produces military and civilian aircraft; Su and MiG fighter jets, the Yak-130 combat trainer, the Sukhoi Superjet-100, the MS-21 passenger aircraft, and the Ilyushin Il-76MD-90 strategic airlifter. The Su and UBS Yak-130 fighter jets are in particular demand, as well as Be-200 amphibious aircraft. The UACs total sales amounted to $7.7 billion at the end of 2014. At the end of 2014, the USC’s rank rose two places. The USC is a monopoly in the production of nuclear and non-nuclear submarines, surface warships of different classes, as well as civilian ships and oil drilling platforms. The company has developed a stable network of buyers; Varshavyanka-class submarines are bought by India, while Vietnam buys Gepard-class frigates, in addition to these submarines. The holding company is up three spots in the ranking, with total sales amounting to $3.9 billion. Russia’s armed forces got more than 100 new helicopters like the Ka-52 and Mi-28N every year, while some of the world’s most-produced helicopters, the Mi-8 and the Mi17, patrol the skies over countries in Asia, Africa and Latin America. The UIMC makes and develops communications devices and systems, robotic systems and automated command and control systems. The company entered the list for the first time. The UIMC's products are supplied to more than 30 countries, including those in Africa, Asia, Latin America and the Middle East. Compared to its 2013 ranking, the UEC fell two places. The company makes engines for Soyuz launch vehicles, and engines for military and civil aircraft, as well as gas turbine-powered generators for ships. The corporation's total sales amount to $4.2 billion. High Precision Systems is another newcomer to the list, with total sales of $2.3 billion. The company produces high-precision systems and tactical combat zone weapons systems. The Pantsir-SM1 and Palma land and naval close-range air defence systems, as well as the Kornet-E anti-tank system, are popular among foreign buyers. Pantsir systems are in service with the United Arab Emirates army and cover the Russian military base in Latakia, Syria; Palma ship air defence missile/gun systems are installed on Gepard-class frigates for Vietnam; while Kornet systems are used by the Peruvian Army. KRET made the biggest jump, rising nine places to no. 45 in the SIPRI list. It is the leading manufacturer of airborne equipment and avionics as well as electronic warfare systems. Given the secrecy and technological advancement around most of the KRET's systems, the holding company’s main client is the Russian Defence Ministry. KRET is also actively working on civilian projects, including abroad. The Ulyanovsk Instrument Manufacturing Design Bureau (UKBP), part of the KRET, has supplied equipment for hydroelectric control systems to the Republic of Ecuador.